Another area in which parents can help is by encouraging children to have their own opinions about things. If a child becomes aware that his views are respected, then that, too, will give him self-confidence. If everything he says is always made fun of, then he soon learns to hide behind the opinion of the majority—in other words, peer pressure. Competition and the desire to be first: This is another area that requires delicate handling. Competition means someone wins and someone else loses, and we should all be able to deal with both. Help your children find the rewards for doing their best; show your pride in them for making the attempt. Encourage them to focus on their own effort, not on winning. Let them know that you believe effort counts as much as prizes. It’s just as important to be able to say, “I did my best” as it is to say “I won.” Your children will then learn the value of being as good as they can be, rather than in being better than someone else. Your child will not always get high marks: There is a fine line between encouraging your children to do their best and making them feel that they are failures when they do not achieve the standard of excellence expected of them. Expecting too much of them can be cruel. Feelings of failure are listed as one of the main causes for the shockingly high number of student suicides. So make sure that your child knows that you love him, whether he brings home top marks or not. Children are often lazy; then try and motivate them. They may not have understood the subject because it has been badly explained; then see if you can give them help. They may not like their teacher (or feel the teacher doesn’t like them) so they don’t feel like putting in any effort; try and sort the problem out, but make sure you are helpful, not condemning. Sometimes, it is just a matter of accepting that your child is not likely to reach the scholarly heights that you had hoped he would achieve, but does it matter? “Nowadays, parents are anxious to see their children become scholars rather than men and women of character. Only those parents are worthy of esteem who prefer that their children should develop good qualities rather than just academic distinction. Education is part of life, but it is not the be all and end all of life. Virtues are the real backbone of life.” They may need to be shown that academic failure is not the end of the world, and that you are ready to help them make a worthwhile life for themselves in other ways. If a child lives with acceptance and friendship, he learns to find love. Praise is good, but don’t overdo it: It has at last been realised that a child does need some encouragement and praise but, like most things, this can be overdone. Give praise when it is due, but don’t shower praise on shoddy work and half-baked efforts. Your child is no fool, and knows perfectly well that it could have done much better, and so loses respect for your judgement if you are too easily satisfied. It is much more helpful to examine the work carefully (whether picture, homework, sandcastle, or anything else) praise the good parts, then give constructive hints on how it could be improved. Compiled by Sathya Sai Institute of Education West Indies. The Sai Nilayam at No. 113, New Chetty Street, Colombo 13 will celebrate the 84th birthday of Sri Sathya Sai Baba on November 23. The program will commence at 5 a.m. The inter-religious flag hoisting ceremony will commence at 9 a.m. and special poojas and bajan will be held the full day. A Sai Chariot Procession will be held on the November 22 at 6 p.m.
Chirag Parmar is proud of his mother Rekha Parmar’s will power to further her education at the University of Fiji. The best part is he gets to see his mother walk the halls of the university while making his way to his lectures at the same time. 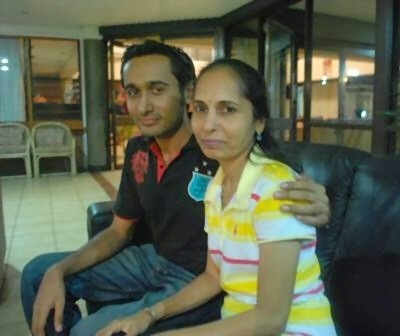 Chirag and his mother attend the University of Fiji and while some feel uncomfortable at the thought of attending the same school with their parents, Chirag feels nothing but pride and love for his mother. The 19-year old completed his secondary education at Natabua High in Lautoka and is pursuing a Bachelor of Commerce degree from the established university in Nadi. “It doesn’t bother me that my mother and I attend the same university or that we’re schooling together,” Chirag said. “In fact, I have a sense of pride that my mum is making the effort to go back to school and further her education.” Rekha Parmar, 44, was born and bred in Bombay, India and completed a Bachelor of Commerce from the University of Bombay. She came to Fiji in 1990 and started a family, sacrificing her desire to continue with her education. She said life was different back then because she had a family and her priority was providing for her children. “I couldn’t continue with school because I had my children to take care of and I decided to work to help support the family,” Rekha said. “I was always interested in teaching and I joined the workforce. I wanted to make use of my degree and do something. Rekha said when her children were old enough to look after themselves she decided to continue with her education. She was involved with the Smart Kids program for primary school teaching. Her passion for teaching pushed her to enroll in an Edu-care program through the Sathya Sai organisation. “It was a training centre. I completed a diploma in teaching. I also started taking classes in India for the education and human values program,” Rekha said. She works at the Computer Studies Center in Lautoka and said her experience at the computer school persuaded her to enhance her qualifications. “This place offered me the opportunity to continue with my studies and it guided me through the process of gaining higher qualifications,” she said. “I feel good and happy that I’m able to continue with my education and even though I am in the same university as my son, I am proud of both of us. Rekha believes it’s never too late to go back to school or to do the things you want to do. She has this year to complete a postgraduate diploma in teaching. The eldest son in the family, Chirag said his mother is a good example for many people who think age is a barrier when it comes to getting a good education. He said she has shown that age does not matter when education is involved and anyone can go back to school. All they need is determination, hard work and sacrifice to succeed in the end. “My mother has shown that age is no barrier when it comes to education. I am very proud of her and I’m happy that she has decided to continue with her studies,” said the former IQ Active member of Natabua.